The Professional’s Shop at Tylney Park Golf Club has all the latest golf equipment and golf clothing at competitive prices. Our friendly and experienced team has developed a reputation in giving professional impartial advice to help golfers make the right choice to improve their game. In addition to the Pro-Shop, Tylney Park now offers you the ability to shop and purchase most golf products online from the majority of the leading brands. To view the comprehensive ranges available, please visit the pro-shop today! The professional staff offer a great coaching experience in wonderful surroundings. Whether you are looking for individual or group coaching, we have the package for you! Please drop by to discuss your goals for the coming season! Here are some headline products. 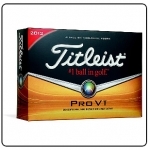 Titleist have improved on the number 1 ball in golf, used worldwide and proven on tour the Titleist Pro V1 Golf Ball has been engineered for distance with a consistent flight, soft feel for control and is longer lasting. Performance for every player and now with even softer feel, greater distance and more durable. Constructed using multi-component construction the Pro V1® golf ball utilises a softer compression ZG process core technology which features a responsive ionomeric casing layer, and an improved high-performance Urethane Elastomer™cover system with a 352 tetrahedral dimple design. 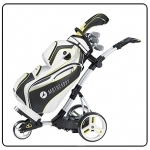 The brand new, compact-folding M3 PRO electric trolley borrows the twin-tube frame and three-point folding system made popular by the M1 PRO and developed to make the folded dimensions over 40% smaller than its S-Series counterparts. Boasting the sporty look and eye-catching trim of the M-Series range, the M3 PRO offers an integrated Accessory Station and adjustable handle height, as well as performance features including ‘lost ball’ timer, ‘round’ timer, clock and battery meter, plus a full-colour digital screen with multiple distance readings. It also includes an inbuilt device cradle capable of holding a wide range of GPS devices that can be powered from the patented USB charging port. Members come first, second and third!